From new series to longtime and recent favorites, this week had a strong crop of new comics. We picked a few of this week’s new releases that we thought were standouts. This is the fifth of our seven-part series of New Comic Book Day blog articles. Be sure to comment or share our post on Facebook or Twitter if you like our articles! SPOILER ALERT — We try to keep as many spoilers under our hats as possible, but a nugget may sneak through to our reviews. 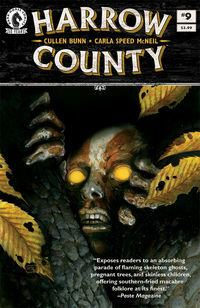 This issue of Harrow County sees Eisner-winning creator Carla Speed McNeil (Finder, No Mercy) join the team for an issue that takes a pause from our story thus far to focus on one of my favorite characters, the Skinless Boy. You can see Bunn’s pacing himself in this issue, letting the story slowly unfold to reveal yet another piece of the puzzle. Even if you haven’t been following the series thus far, I recommend that you check out this issue–you won’t be disappointed. As far as art, I think Carla Speed McNeil was an inspired choice for this issue. Barry Allen is brought in to a task force assembled by the Central City Police Department to bring in the Flash! 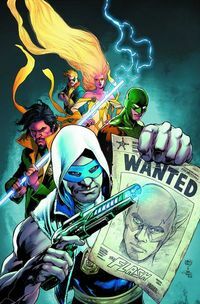 As if that weren’t bad enough, the other members of the task force include the Rogues: Golden Glider, Mirror Master, Weather Wizard, Trickster, and of course, Captain Cold. Jonesy seems like a typical teenage girl: She’s cute, lovable and we can all relate with her everyday struggles in high school. However, there is one little thing makes Jonesy unique from all the others . . . she’s got a wacky super power and a pet ferret! 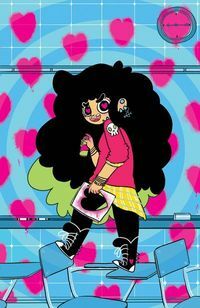 While dealing with the biggest event for high school, the dreaded Valentine’s Day grams, Jonesy starts to show her super-secret superpower throughout the school day. People start to catch on but she doesn’t care! She is taking charge and taking no nonsense from anybody in this issue but soon ends up finding her sole purpose is to teach her high school a lesson. Life can be tough for a teenager: you have school work to get done on time, friends to keep up with, family to keep happy — and then there’s always being an Avenger. That seems to cut into all of the other time. 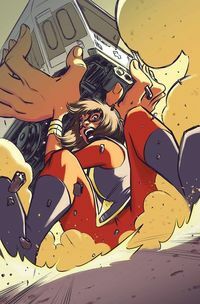 In this issue of Ms. Marvel, Kamala has to find a way to balance her home life, school life, and trying to earn confidence from Captain America and Iron Man. No problem at all, right? Especially with some help from her friend Bruno and something he’s been working on in the science lab. Next article Star Trek Manifest Destiny is Coming — buy’ ngop!